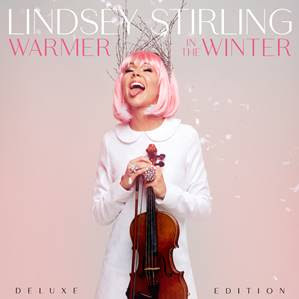 "Warmer in the Winter (Deluxe Edition)," from critically acclaimed and two-time Billboard award winning electronic violinist Lindsey Stirling, has held a firm top 10 spot on the Holiday Albums chart for an impressive 8-weeks straight. Currently sitting at #7, the album debuted as the #1 Holiday album in the country upon its October 19 release, and to date, has reached total consumption of nearly 250,000 units in the US. The album’s lead single “Carol of the Bells” hascatapulted into the Top 10 at Mainstream AC Radio, where it was the #1 most increased song at the format and the #1 most increased song on the holiday chart. To date, Stirling’s version of “Carol of the Bells” is the first instrumental song ever to reach the Top 10 at Mainstream AC radio, setting a new record. An expanded version of last year’s best-selling holiday album Warmer in the Winter, the newly repackaged Deluxe Edition features five bonus tracks from Lindsey, including the holiday classics “I Wonder as I Wander,” “Santa Baby,” “Main Title from Home Alone (Somewhere in My Memory)” and more. An additional two new recordings, “Mary Did You Know” and “Home for the Holidays” are available exclusively on all album purchases made through Target. Since November, Lindsey has been on her 25-city nationwide tour The Wanderland Tour, in support of the album. Featuring a fully revamped stage production with elaborate holiday themes, as well as, Stirling’s signature brand of dance routines and on-stage visuals, the tour has been well received by audiences across the country. Tickets for all remaining shows are on-sale now. The tour wraps December 22 in North Charleston, SC. For complete ticket purchase information on all tour dates, visit lindseystirling.com/tour. Last year, "Warmer in the Winter" went on to become the best-selling new Christmas album of 2017, outselling pop music heavyweights such as Gwen Stefani and Sia. It was also the best performing holiday album on Pandora with over 40 million spins and had the biggest debut for a holiday release last season. Lindsey Stirling remains fearless enough to always dream big. In the over five years since the release of her 2012 self-titled debut, the electronic music impresario, violinist, dancer, and artist quietly and humbly became one of the 21st century’s most innovative stars by clinging to her groundbreaking vision of cinematic violin-driven electronic music. After bowing at #2 on the Billboard Top 200 and #1 on the Dance/Electronic Album Chart, holding #1 on the Classical Album Chart for 21 consecutive weeks, and receiving a Billboard Music Award for “Top Dance/Electronic Album,” her sophomore opus Shatter Mewould not only garner an RIAA Gold certification, but it would rank as the #2 Dance/Electronic Album and #1 Classical Album on Billboard’s 2015 Year-End charts. Attracting over 10 million subscribers and 2 billion-plus views on YouTube, in 2015 Forbes placed Lindsey at #4 on its yearly YouTube artists list, making her the highest-ranked female. Her headline tours would play to a cumulative audience of over 500,000 people worldwide, and her literary debut The Only Pirate at the Party—co-written with her sister Brook S. Passey—became a New York Times Bestseller. Lindsey’s third-studio album Brave Enough, debuted at #5 on Billboard’s Top 200 Album Chart, went on to score the #1 spot on Billboard’s year-endTop Dance/Electronic Album list and earned Stirling a 2017 Billboard Music Award for “Top Dance/Electronic Album”. Last year, Lindsey released her first ever holiday album titled Warmer in the Winter. Featuring classic and original songs, the album went on to become the #1 new Christmas album of 2017, ahead of pop music heavyweights such as Gwen Stefani and Sia. It was also the best-selling new holiday album and the best performing holiday album on Pandora with over 40 million spins. She is re-releasing her top-selling Christmas album this year with a few new songs as well as some Christmas classics. She was also the runner-up on Season 25 of ABC’s hit show “Dancing with the Stars” with her partner Mark Ballas. Stirling is currently co-heading a US tour with rock band, Evanescence, and it's one of Live Nation’s 10 best-selling amphitheater tours of the summer. Stirling is the model of a modern independent recording artist, with a symbiotic relationship with her fans. A motivational speaker in her spare time, Stirling uses her own story to show teenagers that you’ve got to have confidence in the very thing that makes you unique – then wait for the world to catch up.